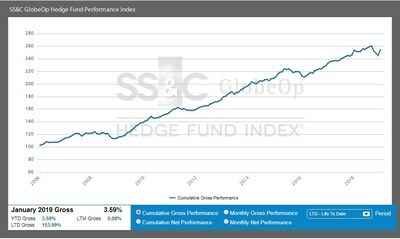 SS&C GlobeOp Hedge Fund Performance Index and Capital Movement Index_02-13-2019 - SS&C Technologies, Inc.
WINDSOR, Conn., Feb. 13, 2019 /PRNewswire/ -- The gross return of the SS&C GlobeOp Hedge Fund Performance Index for January 2019 measured 3.59%. 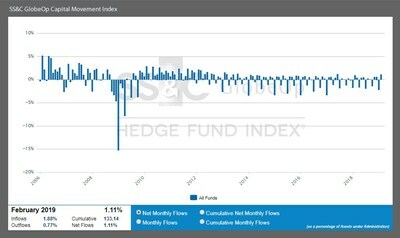 Hedge fund flows as measured by the SS&C GlobeOp Capital Movement Index advanced 1.11% in February. "SS&C GlobeOp's Capital Movement Index for February 2019 of 1.11% shows increased net flows compared to the 0.96% reported for the same period a year ago for February 2018," said Bill Stone, Chairman and Chief Executive Officer, SS&C Technologies. "In fact, the 1.11% reported for February 2019 represents the largest net inflows for any February since 2013. This favorable result continues the generally positive net flows into hedge funds we've seen since market volatility rose abruptly this past October." Cumulatively, the SS&C GlobeOp Capital Movement Index for February 2019 stands at 133.14 points, an increase of 1.11 points over January 2019. The Index has declined 3.17 points over the past 12 months. The next publication date is March 13, 2019.